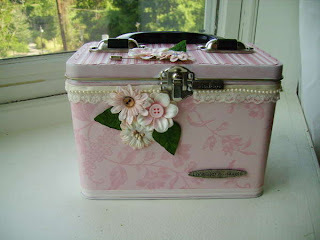 This is how I decorated a lunch box tin I received as a gift for attending a crop. I used Prima Flowers and Anna Griffin paper. It has been a great storage place for my cardmaking kits...except I have now outgrown it. I am getting hooked on making cards...So I think I'm gonna need another container.